European Parliament, Brussels. Committee on Civil Liberties, Justice and Home Affairs (LIBE) meeting – 4th NSA inquiry hearing. (EP Audiovisual Services, 30/09/2013). The members of Civil Liberties Committee (LIBE) of the European Parliament and the European Commissioner for Home Affairs, Cecilia Malmström will discuss on Wednesday 9 October the possibility to ask for the suspension or even the termination of the EU-US agreement on the Terrorist Finance Tracking Programme (TFTP). This action will come as a response to the American National Security Agency snooping scandal relating to personal bank information data of millions of EU citizens, exchanged through the SWIFT network. According to information published in the Press, NSA bugged EU’s central building in the US and also taped EU citizens’ bank data, handled by the Belgian company SWIFT. The revelations about NSA spying on bank-to-bank messages through the Society for Worldwide Interbank Financial Telecommunication (SWIFT) network came from top-secret documents, leaked by whistleblower Edward Snowden to the press. Probably more than 11,000 thousand banks and other financial entities worldwide use SWIFT for theirs and their customers’ financial transactions and messaging. On 24 September Malmström informed the MEPs that she had not yet received satisfactory replies from the US authorities, concerning the allegations. She said she had written to the Under Secretary of US Treasury, David Cohen, on 12 September to ask for clarifications, following the allegations in the Press that the NSA had been wiring personal financial data from SWIFT’s international bank-transfer database. Then she stressed “I am not satisfied with the answers I got so far…we need more information and clarity”. It must be noted that the Commission has requested formal consultations with the US under Article 19 of the TFTP agreement. This is the normal way to seek its suspension or termination. “If media reports are true this constitutes a breach of the agreement and a breach of the agreement can lead to suspension,” Mrs Malmström pointed out on Tuesday 24 September. She also clarified that, “If the Commission deemed it necessary to propose a suspension, “this should be decided by qualified majority in the Council”. After the debate scheduled for Wednesday 9 October at the Civil Liberties Committee, the full Parliament will vote on a resolution on this issue at its second plenary session of 21-24 October. Judging from the mood that prevailed during the September meetings, next Wednesday the MEPs of the Committee will most probably ask the Plenary to propose the termination of the EU-US TFTP agreement. During the September meeting Claude Moraes (S&D, UK), committee rapporteur for the inquiry, asked his fellow MEPs: “Would you agree to suspend the agreement given the unclear answers from the US?” Parliament’s rapporteur for the TFTP deal, Alexander Alvaro (ALDE, DE), confirmed that he would be in favour of suspension as a “minimum option”. 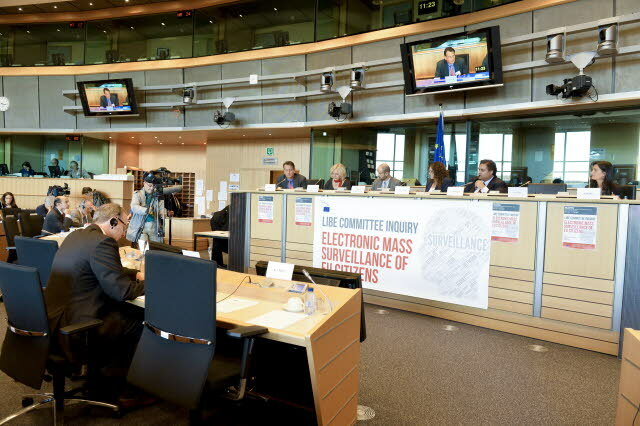 During previous hearings of the LIBE Committee, the MEPs had the opportunity to discuss this issue with the Europol and SWIFT representatives. Both of them however had nothing to add to the debate. As non-elected officials usually do, they both fortified themselves behind strict official procedures. “We simply have no evidence of the US being in breach of the TFTP agreement, so we cannot confirm or deny any of these allegations,” the director of Europol, Rob Wainwright, told the inquiry, insisting that the EU police agency had “no direct cooperation with the NSA or the CIA”. The same ‘ni vu, ni connu’ line was followed also by Blanche Petre, General Counsel of SWIFT. When asked by MEPs if he had any indication of any form on the alleged taping, he said “We have no reason to believe that there has been an unauthorised access to our data”. This is the kind of officials who prefer to insist that nothing happens, even if the entire city outside their windows is on fire. In any case the issue will soon be clarified in the full Parliament and most probably the Commission will be mandated by the legislative to ask the Council to seek termination of the EU-US TFTP agreement.